One thing I know I’ve done is slack off on my homeschooling posts. Some of you may be relieved by that as you follow this for adult book reviews. However, this is something I plan to be more consistent about in the year 2014 (what’s a new year without resolutions to fail at?). So, I’ll start with our wonderful Christmas gifts and how that has altered our January plans for the better. Title: There’s a Map on My Lap! With her birthday money, kiddo picked out and purchased Oh Say Can You Seed? (All about flowering plants) and If I Ran the Rain Forest (All about tropical rain forests). I was so proud of my three year old, she picked them out herself without being swayed by me and she continues to select them to be read at bed time – obviously not swayed by me because bed time is when I want to read the shortest book possible. Each one of these books includes all sorts of information, new vocabulary words, and everything a kid needs to know to get started with that particular topic. There’s even a handy glossary at the end that could later serve as a spelling word list. So when we saw There’s a Map on My Lap we were pretty excited. 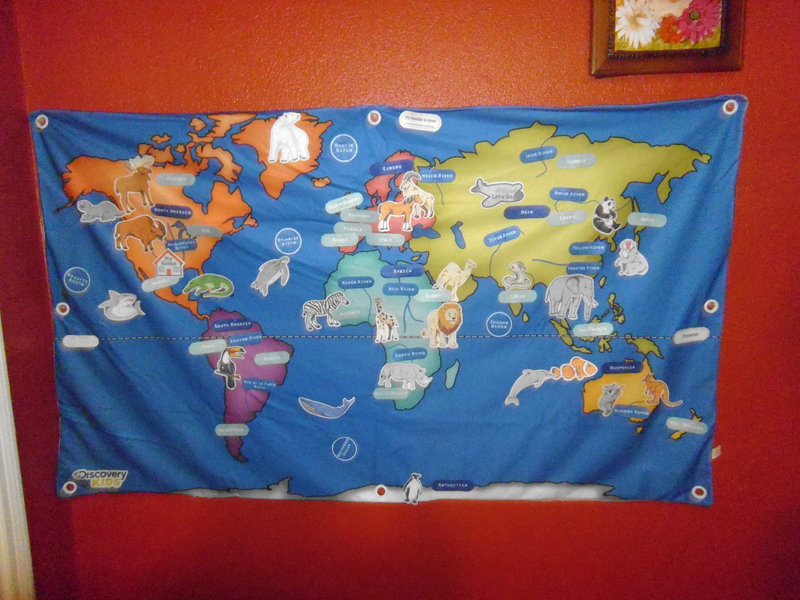 And when Grandmom got her a Wall Map too – well, it was all over. We have been having ‘map time’ every chance we get. We did a pretty extensive Titanic unit awhile back. We read both Magic Tree House books as well as a few of those early reader books. There was a picture book we tackled, and we even found a replica of an old newspaper page from the day the Titanic sunk. Kiddo likes history and really likes boats and ships. She built our very own Titanic out of play dough one day, which was pretty exciting. 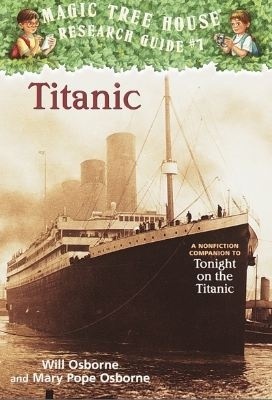 I will not have a kid that watches the Leonardo DiCaprio movie at 16 and says, “I didn’t know that was REAL!” (http://www.washingtonpost.com/business/technology/titanic-tweets-some-say-they-didnt-know-titanic-wasnt-just-a-film/2012/04/10/gIQA8fZY8S_story.html). Christmas was kind to us in regards to school projects. 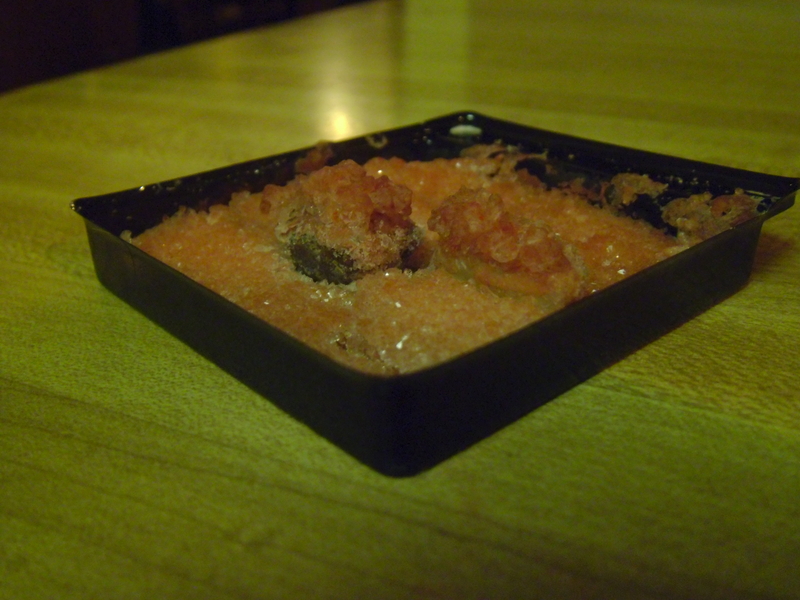 Already we have started the year off by growing rock crystals of our very own. This was more of a lesson in patience than anything else. She thought the science lesson was cool, but really it was about learning to go check on it every hour on the hour and how long an hour was. We’re pretty excited about 2014 and what it has in store for us. Kiddo turns four in October and we have so many fun things to do before then. 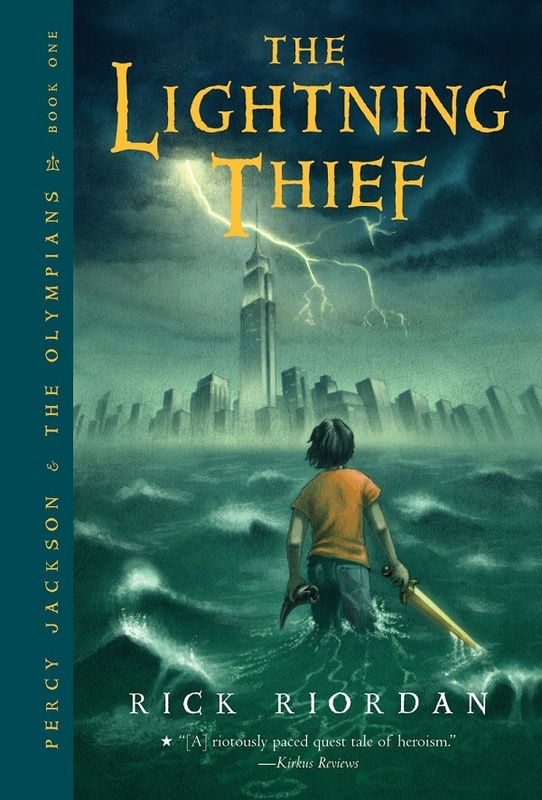 Magic Tree House Research Guide: Ancient Greece and the Olympics (which we just finished this morning over breakfast and coffee). 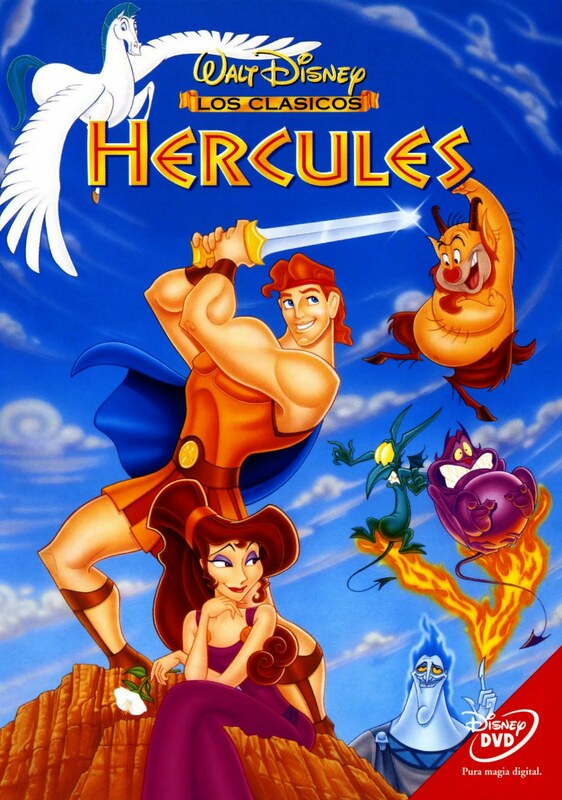 Also during this little stint we’ve read and re-read the Golden Books: Disney’s Hercules… over and over and over again. And the little Grecian wanna-be has enjoyed the movie probably too many times than can be good for her little developing brain. All in all, tromping through this stuff now with her so little has helped me wrap my brain around the plans we have for ages 5 & 10, roughly. Keep lots of wiggle room in mind. Of course I’d like to include a trip to the museum. 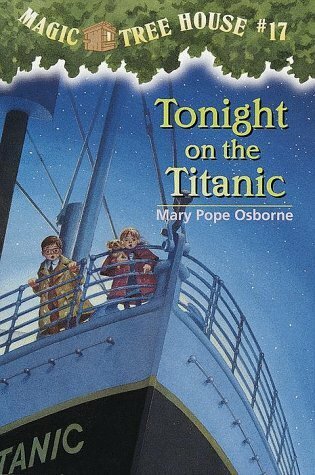 The Odyssey as Retold Mary Pope Osborne (to be read on her own or together as a family), the author of the Magic Tree House books. As everyone else heads back to school, I looked over the last month and realized we really did treat the hottest months of the year like a summer vacation this year… mostly lolling around the house between events, taking extra naps after our dance parties in the living room, and mostly hiding our pasty skin from the hot, Texas sun. So I tackled cleaning out the closets, while everyone else was out buying school supplies, and organized our life the way it has always been organized in my brain… in unit studies. Of course, that got me in the mood to really tackle “school time” with more vigor and this last week or so we jumped back into the swing of things with Ancient Greece and Rome and then The Vikings and the Celts. Viking Ships at Sunrise by Mary Pope Osborne was next in our Magic Tree House Adventures. 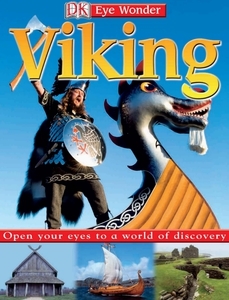 We have not acquired the Viking research guide yet, but I believe there is one. We also re-read DK’s Eye Wonder Viking book, we had read it once before while perusing the exciting world of piracy, and a little repetition is good for a kiddo. But the really exciting book for this particular unit study was The Hero Beowulf. 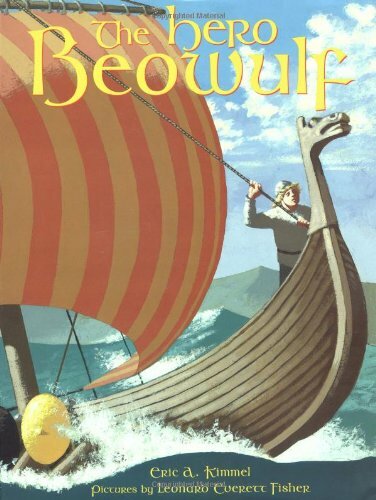 Eric A. Kimmel’s retelling of Beowulf is a pretty neat picture book add on for little people. It’s illustrated by Leonard Everett Fisher and is complete with an author’s note about the original poem in the back. Beowulf, after all, isn’t just a monster myth, it’s the “oldest surviving epic poem in English literature,” all the way from the sixth century, to your hands now. I can’t reiterate enough how much the classical education style appeals to me by teaching so much history through the other subjects… or rather teaching all the other subjects by tackling history so thoroughly. I love that there are so many resources, like Kimmel’s picture book, to make the tales and the culture more real and the epic poem more accessible when the time comes to tackle the original work; because in classical education everything repeats at a higher level over and over again. After reading The Hero Beowulf, kiddo ran to grab other books with Viking ships on them and said, “Look mommy, more Beowulfs!” So she doesn’t entirely get it yet, but hey, she’s two. This book was an unexpected treasure from the public library. Kiddo picked this book out herself and I was really excited about it once I was in the middle of reading it. 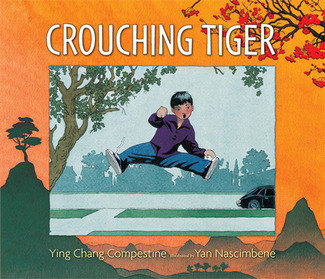 As a third degree black belt who grew up around a lot of Chinese culture, I love finding unique children’s stories like these. It teaches etiquette, respect for your elders, culture appreciation, diligence, perfection through practice, and each page also has a diagram of a Tai Chi stance. This was an excellent book to jolt us into our week on Ancient China. 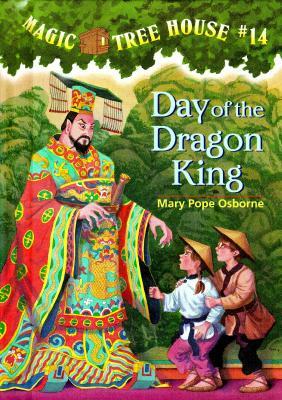 Although we don’t have a research guide for this topic, we’ve been perusing all things Ancient China while reading this book this week. There are pages from Life in the Ancient World specifically on the Chinese that we read through for a second time, I can’t wait to do some of the art projects when she is older. Although we didn’t do anything crafty with this week’s topic, we did enjoy some stir fry for dinner and kiddo got to practice eating with her toddler chopsticks. The kiddo’s chopsticks are an orange elephant, but the concept is pretty much the same. These things are so handy and I think they are a great way to give your tiny person an ounce of how other countries live. So onward with The Magic Tree House Adventures. We read Ghost Town at Sundown and Lions at Lunch Time. With Lions, we read LIONS by Kathy Darling and enjoyed all the many photographs taken by Tara Darling-Lyon. Kiddo also got to watch The Lion King for the first time this week and we practiced drawing the letter L and colored a giant lion head into her notebook. 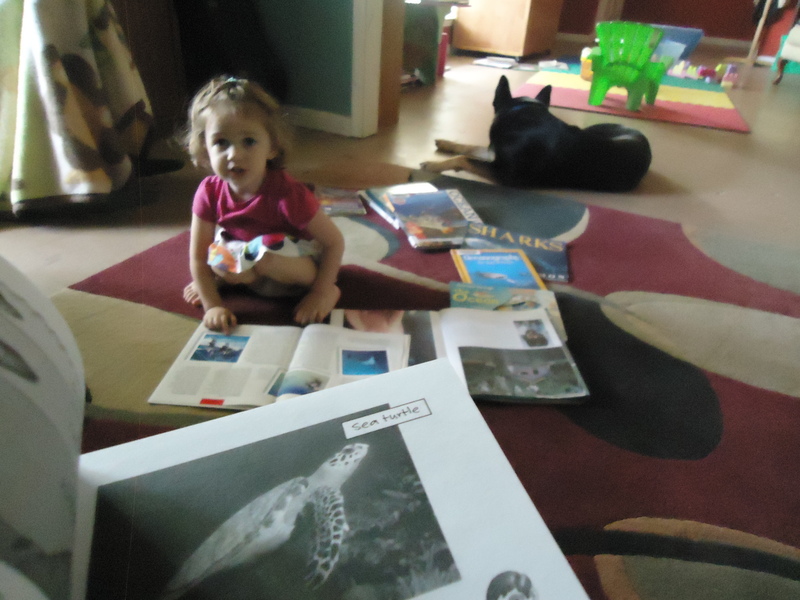 Kiddo really loves looking at the pictures of all the animals. From identifying the baby bears to asking me what “those things are on him” hanging off the lion (his testicles), we’ve had a full two weeks learning about different kinds of predators and their environment. 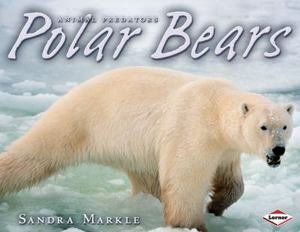 She finds Africa vs. the Arctic fascinating and is now able to identify the two places on the map. Yay for little tiny humans being enormous sponges for knowledge! Magic Tree House Adventures took us to the ocean! We tackled our next Magic Tree House adventure this week… the one on Space! 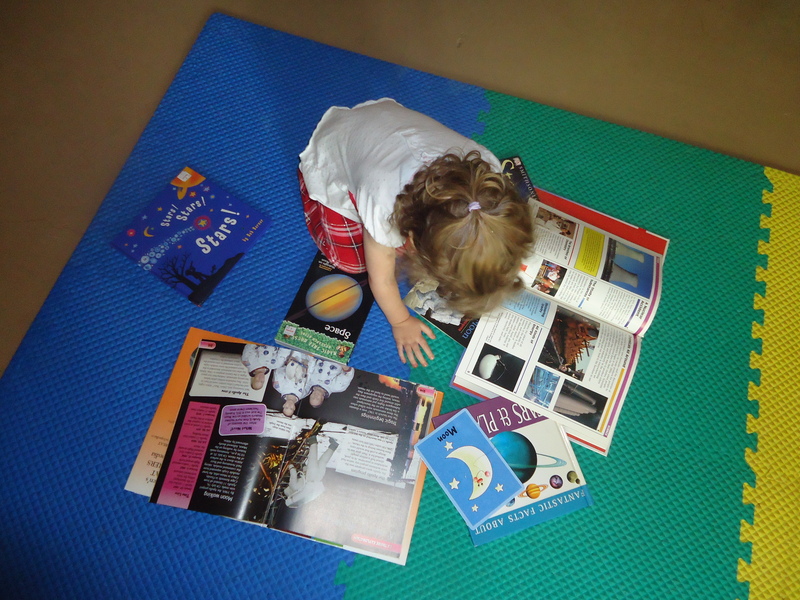 When we read through the research guide on Space, she kept wanted to talk about Galileo. She really liked the picture of him and finds pleasure in saying his name. Not exactly sure what fascinates her about the man, but I’m glad she took an interest in Astronomy this week. Stars, Stars, Stars! 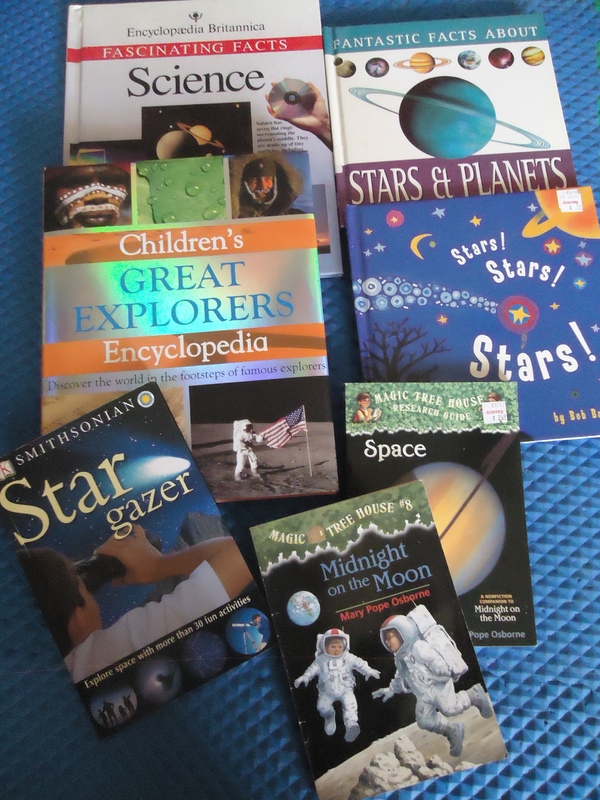 is a great book to start a kid out on the wonders of space. 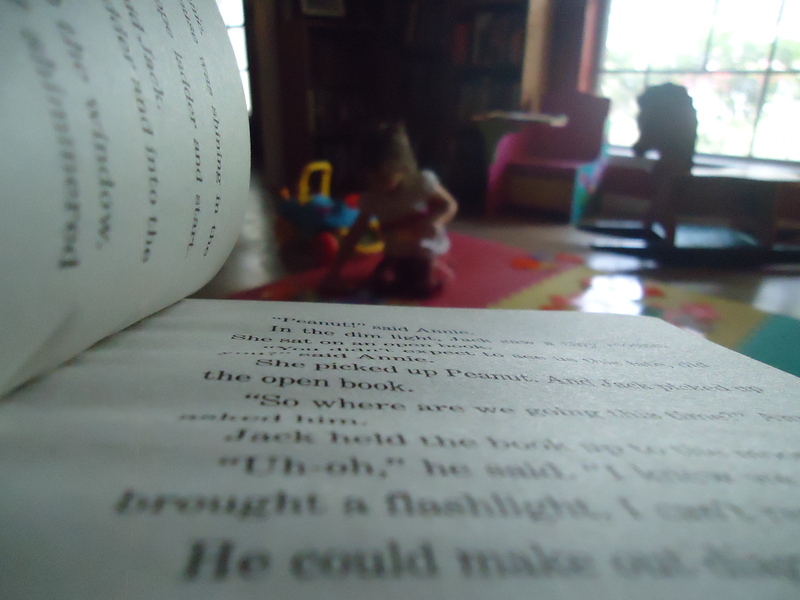 Magic Tree House Adventures in my library with my toddler. I can’t wait to take her to the Natural Science and History museum! I think it’s about time for her first trip. She is completely enthralled with Jack and Annie now, and begs for the next story as soon as we’ve finished the last. 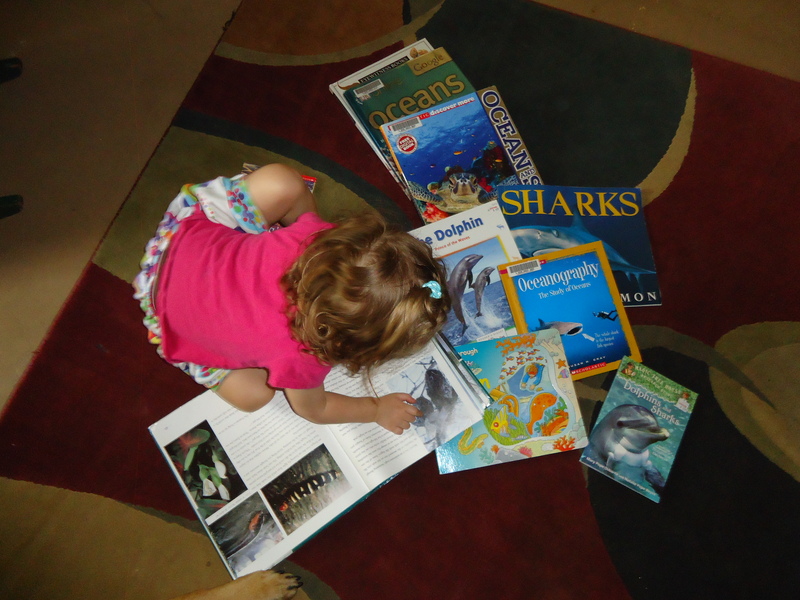 For parents just coming in for these blog posts, it helps to have some kind of tactile activity and/or lots of related picture books available while toddlers listen to chapter books. 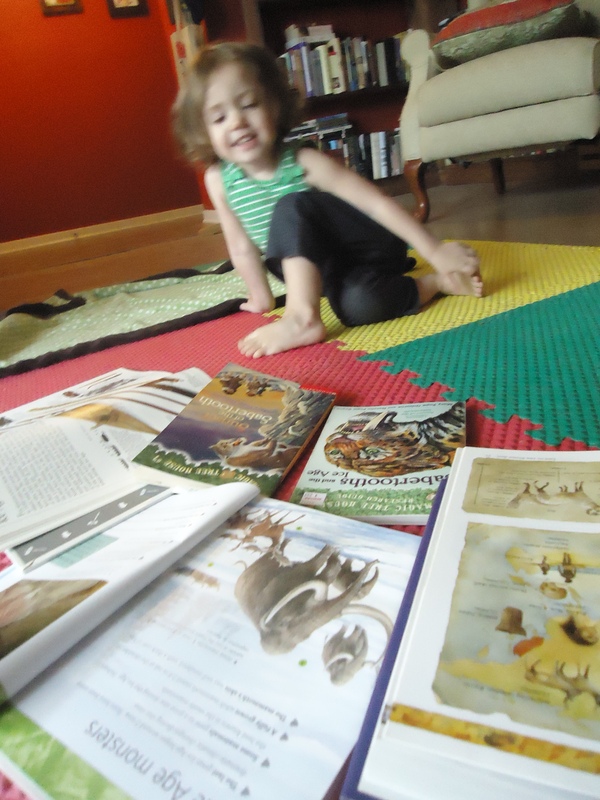 She was really into the bits about the Woolly Mammoths. We learned from Mary Pope Osborne’s research guide that there were different kinds of mammoths: Columbian Mammoths were the biggest, Woolly Mammoths the second largest, and there were smaller ones called Pygmy Mammoths. Of course, a two-year old sees these different mammoths and calls them Daddy Mammoth, Mommy Mammoth, and Baby Mammoth. It’s ok, we still have time to figure it all out. My child is enamored by sharp teeth and weapons. She also likes maps and any time a location is discussed in a history book she wants to know where it is in relation to Texas and Virginia. Texas because that’s where she’s from, and Virginia because that’s where Pocahontas met John Smith. 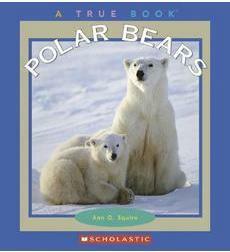 This was the topic of conversation when the Giant Beavers of North America were discussed during our Ice Age study. We prefer the Life in the Ancient World book over the Early Humans book. It has a lot more detail, it WILL be used as our first official History textbook and I already have the lesson plans blocked out. 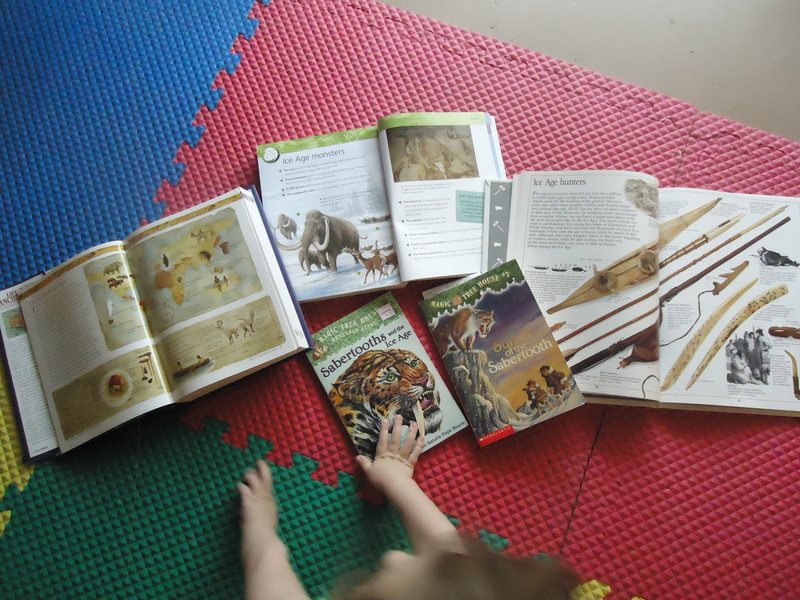 There are projects scattered throughout, both crafty and educational, and I think it is a must have homeschooling tool – especially for those pursuing a classical route. 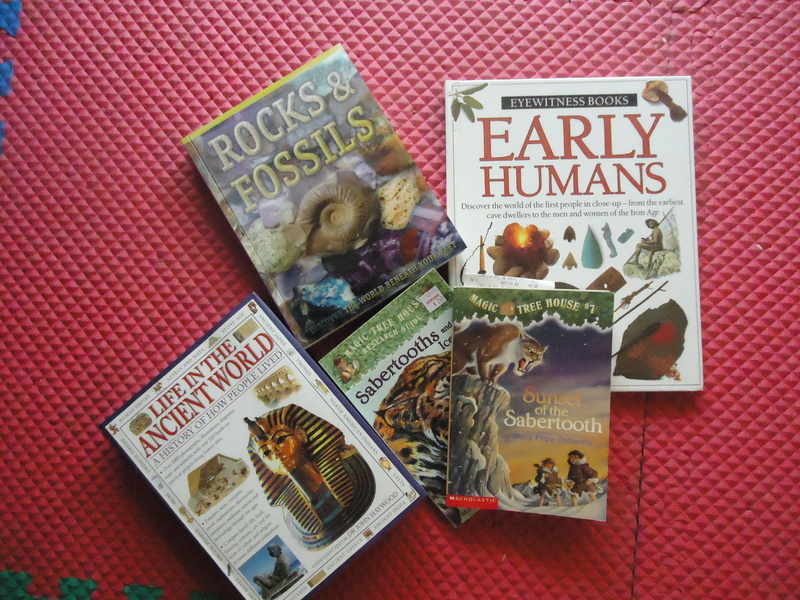 Rocks and Fossils is a really awesome book for an older child. I think around ages 8-11 this is going to be a household favorite. 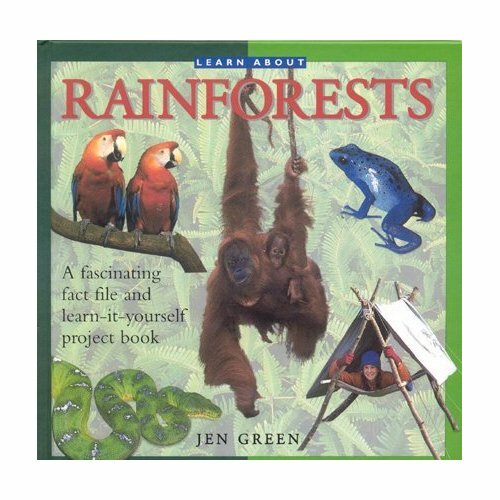 As part of our Magic Tree House regimen, the kiddo and I read through everything and anything we could get our hands on regarding rainforests. It’s been about a week, and every afternoon we’ve been diving into the magic of the Amazon River and its surrounding rainforests. 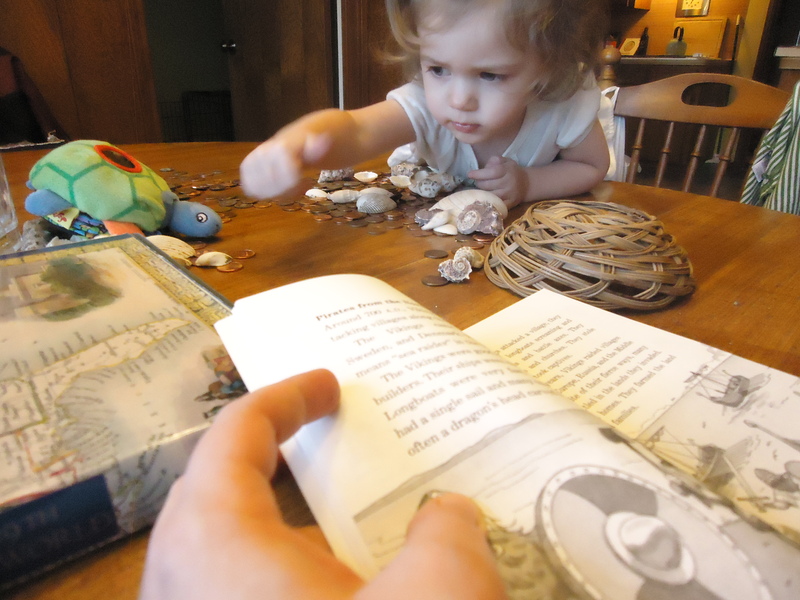 Last time we shared our Magic Tree House Adventures, we’d just finished our fourth set: Pirates Past Noon and Pirates! Fifth in line was Ninjas at Night, and I was searching high and low for a Research Guide (“Fact Tracker”) on Ninjas and could not find one. It looks as though I may have dreamed that one up. 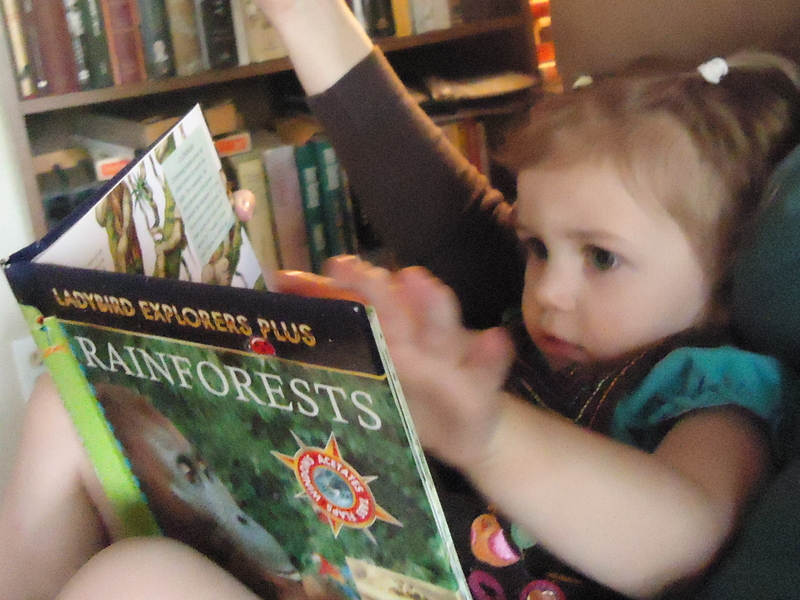 So we read the fictional adventure and moved on to Afternoon on the Amazon and Rainforests, the sixth set. I couldn’t find Rainforests anywhere either! 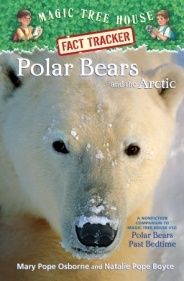 The Ladybird Explorers Plus series are flip/tab books with tons of information. 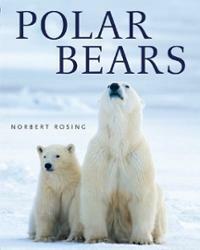 They are great book to have if you have lots of different ages in the house. Even though I can’t say that from the experience of having lots of various aged children, I can say it from the experience of being just as fascinated by this book as my toddler. 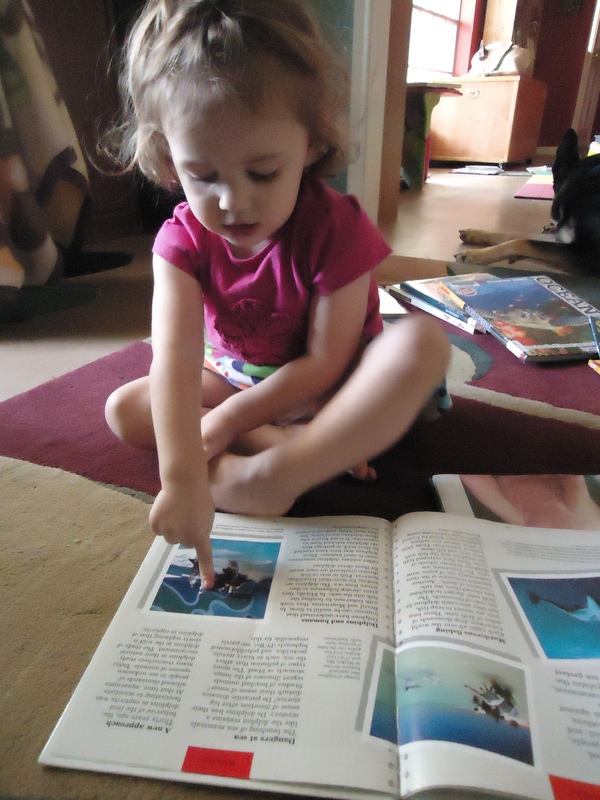 The pictures are lovely, the facts surprising (I didn’t know there were dolphins in the Amazon River, they must have skipped over that in my childhood rainforest studies), and the tabs and flaps were fun. One of our favorite tabs makes an Asian elephant move a heavy log. Another causes the monkeys to swing through the trees. It includes detailed but simple charts with flaps that show the water cycle in a rain forest, and clear glossy photos that overlap pages like you would find for an overhead projector. The chapter “Beauty in the Forest” lives up to its name and is indeed full of very beautiful illustrations of the trees, birds, and flowers. The Learn About series is fantastic for the pictures now, but even more important for all the projects later. This really spells out detailed activities to do with an older child when we tackle the rainforest more formally. It shows you step by step how to plant your own canopy, how to make molds of animal tracks in the forest, and the basics of field studies. It is only 63 short pages in length, but the pages are full of facts, gorgeous photography, and 24 projects geared toward 8-12 year olds. It is advertised as “a fascinating fact file and learn-it-yourself project book” which to me is the very definition of what you should have in a homeschooler’s library. I’m not sure why they are priced so high on Amazon, but I got mine for a couple bucks at Half Price Books. First, I love Usborne. 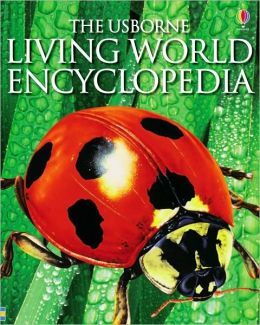 Second, the Living Encyclopedia will be making its way into many lessons, as it covers all living things all over the world. Being that it covers so much, naturally there is a huge section on rain forests that made for some nice supplementary pictures to gaze at while reading our fiction. The kiddo was really taken with the unrelated lady bug on the front cover, but also liked seeing the extra pictures of the dolphins and jaguars while we were reading Dora and Diego’s Adventures, where they travel through the rainforest, use a dolphin to pull them through the Amazon river, and save Baby Jaguar.